Paulina Ahokas, Managing Director of Tampere Hall and a long time expert on cultural life in Finland. Paulina Ahokas is a long time expert on cultural life in Finland, says she now has an amazing network to call upon when she needs answers. 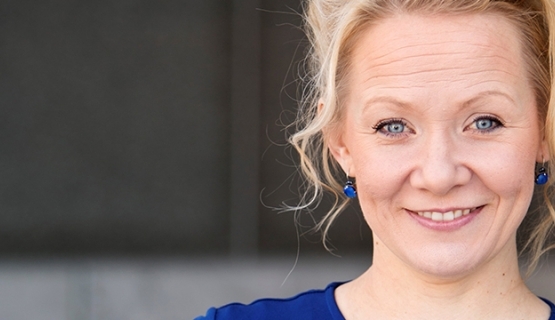 She built the network while studying in the Aalto Executive MBA program. “Let’s face it. People often interact mostly with likeminded friends, and while at work, they meet people from the same sector”, she says, and points out that managers often need to find expertise outside their own field. In her work, Paulina repeatedly notices that the people around her do not always have the answers to all her questions. That’s when she picks up the phone and calls one of her cohort members. Benefits: building the network, becoming a better leader while building a broad base of knowledge, and becoming a better leader by understanding herself better were the others." The Aalto EMBA program had three main benefits in Paulina’s life, all of which she says can be felt in her daily work. Building the network was one, becoming a better leader while building a broad base of knowledge, and becoming a better leader by understanding herself better were the others. “I needed to upgrade my knowledge to be- come a better leader; not just a team leader, but a manager of multipurpose teams”, she says. Financial accounting, management ac- counting, economics for executives, all had an impact on her. She would like to name every single module, when I ask about her favorite ones. The psychological side of the studies came as a bonus. “All of us started out the program thinking we would gain more knowledge- based information, and all of us came out realizing it was the psychological side of leader- ship that affected us the most”, Paulina notes. We all need to know how to become a resilient leader and a more emphatic leader, and the modules, especially the Self Leadership process, gave us the tools to learn about this, she says. If she has to name one specific skill above others, which she acquired during the Aalto EMBA program, it is the skill of concentration. I need to know how to concentrate, otherwise I keep doing things wrong." She now knows much better how to handle conflicts and problematic situations, and she knows how to proceed to positive action when a problem has been identified. And when the question is outside her own field of skills, she picks up the phone and reaches for her network. Read more about Aalto Executive MBA.